I promised myself I would picnic more this summer. Spend more time outside, feeling the breeze dance on my skin and the sounds of passing voices buzz in my ear, pack up a cooler filled with cold soups and icy drinks, sandwich-making ingredients and snacks and remember what it was like to not have deadlines breathing hot against my neck, or obligations too important to pass on. So far this summer, I’ve managed to fit one picnic in – I’m not all that successful at keeping my word to myself. That said, it was a very lovely one where we gathered with friends at a dog park nearby, one brilliantly green and lush with weeping willows and an abundance of grassy spots to laze about during the seemingly infinite days of summer. We drank cold beers (illegally – gasp!) and used a pocket knife to gnaw hunks of Piave cheese onto waiting apple and pear slices. We watched the dogs, tails thwarting back and forth, up and down in cheerful celebration, and rubbed their bellies when they came by for a drink of water and a slice of fruit. It was everything a picnic should have, and could have been. I want more days like that. I vow to make time for them before the absolutely endless days of winter arrive again. 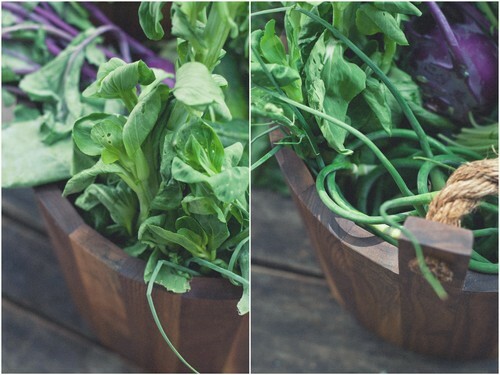 When I arrived at Pascale’s shop to pick up the Farmers Feast basket this month, she explained that she and Tara went with the theme of “green” for the basket, the sides of the it draped in leaves and stalks of every shade from emerald to forest green. It’s always such a treat poking through the ingredients, marvelling at the freshness of them and gently dusting the dirt from their roots. 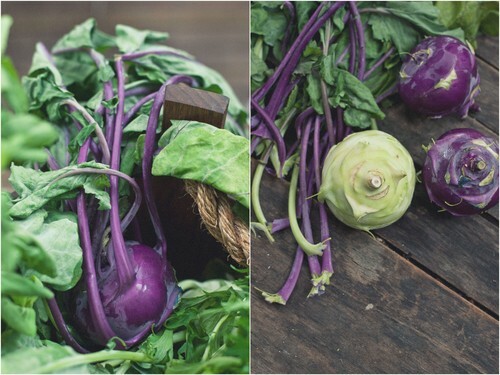 It was hard to ignore the only non-green sparks of colour from the purple kohlrabi and the crimson radish orbs. Typically, I try to incorporate the Farmers Feast basket into one meal using as many of the ingredients as possible. This time around, Tara and Pascale decided that maybe it would be neat to create a few different dishes using the ingredients. Never being one to turn down a challenge, I got to work thinking of how I wanted to tackle the box and eventually came up with a theme of my own – a picnic lunch! 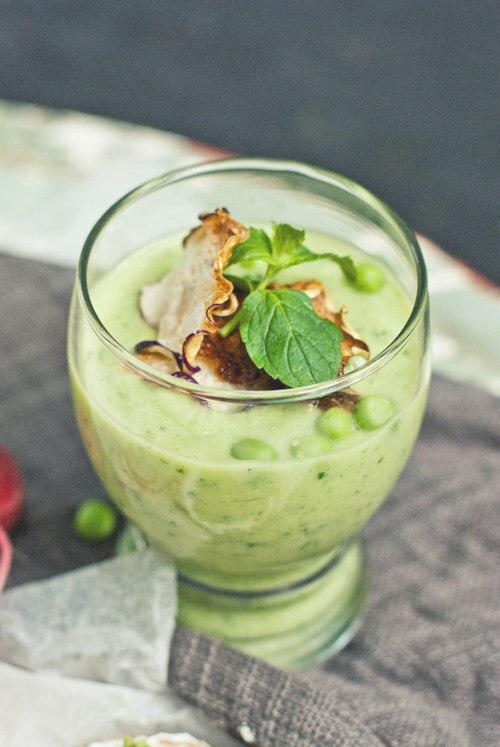 I started out working off a soup and sandwich concept and came up with a cold, creamy and refreshing soup made with avocados and cucumbers (and topped with salty kohlrabi chips!) and an open faced rye crostini with a kicky garlic scape labneh (salted, strained yogurt that turns thick – almost like cream cheese, but way better), a fava bean/sweet pea/mizuna spread that was sweet and bright and just a tiny bit bitter from the greens, and some thinly sliced radishes to add crunch, colour and a bit of a spicy bite. Everyting married so well – each bite offering creamy, tart, spicy, crunchy, sour and savory. My mouth was happy, my stomach even more so. It’s been absolutely been my favourite Farmers Feast to create, and potentially one of my favourite recipes to post on the blog (which says a lot because I’ve been kicking around here for some time). The key here is that you don’t have to put all the recipes together. You can just make the spread or the labneh, or you can just make the soup on its own. Use what you have in your garden and at your farmers market to decide what you’re able to make, and adapt the recipes based on your produce availability. If you don’t have garlic scapes for the labneh, add half a clove of fresh garlic or even some fresh herbs instead. 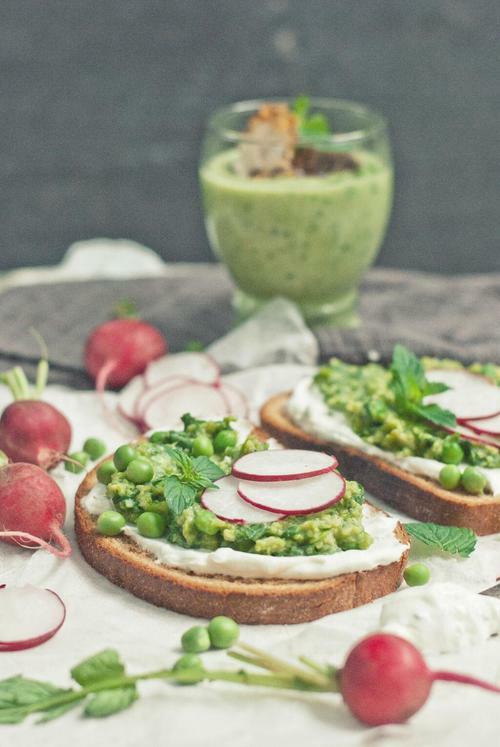 If you don’t have fava beans, make the spread with just sweet peas. It’s that easy! This is just a guide to what you could be doing with all the greens that summer’s throwing at us right now. We’ve started giving away some market bucks for those of you in Ottawa and this month is no different! See below on how you can enter to win one free item from one of this month’s participating farms. We will pick a winner at random this coming Tuesday, July 9th. 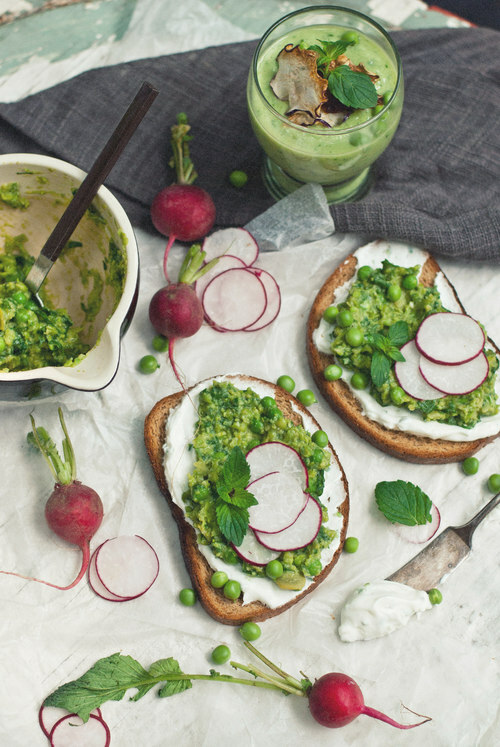 Slather each slice of toasted bread with the labneh. Spoon a heaping mound of the bean/pea spread on top. 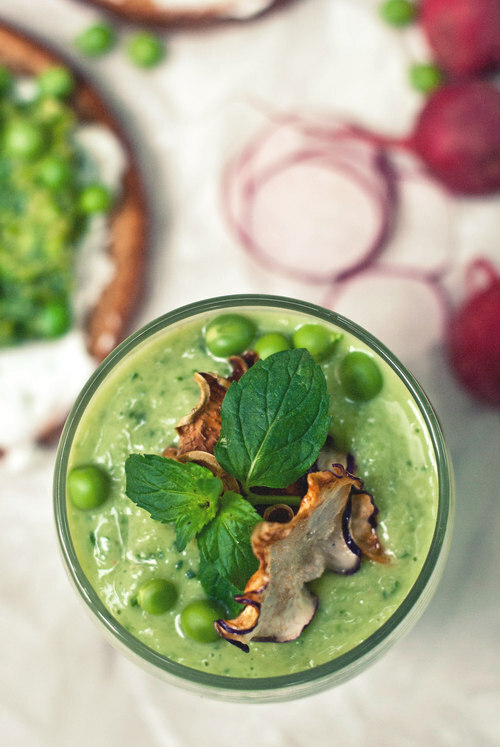 Garnish with radish slices, pea shoots and raw sweet peas. Place ingredients in a food processor and pulse until the dip is spreadable but still has a few chunks to it. Stir in the 2 tbsp of cooked sweet peas. Stir ingredients to combine. Place in a colander lined with a few layers of cheesecloth and let drain over night in the fridge. In the morning, pull the corners of the cheesecloth together and give the labneh a little squeeze to release any extra moisture. Scrape into a dish. Will keep covered for a week. Place all ingredients except for the water in the blender and blend until smooth. If it’s too thick, add water a little at a time until desired consistency. Taste for seasoning and add more salt or lime if needed. Toss kohlrabi with oil and a few pinches of salt and place on a rack lined cookie sheet so the heat can evenly bake the chips. Bake for 30-45 minutes, turning the pan every so often, until golden brown and crisp.